Many young ladies treat the homecoming dance as their coming out party where they try to pull off a bold and inventive fashion choice to steal some attention on the dance floor. However, oftentimes it's better to stay within your own personal style and give it a bit of a face lift for the occasion. If you're not a rocker glam kind of girl, your outfit may seem out of place. Stick to your favorite hues and dress cuts and take some chances with your cosmetics and accessory choices. A formal dress that is accented by a bold shade of eyeshadow or a fresh and vibrant lip color could make a much bigger impact than going over the top with wild cocktail dresses. Don't ignore your footwear choices either - color blocking is a huge trend in the fashion world, so if you have a complementary color or a lighter or darker shade of the same hue, it will be a fantastic addition to your ensemble. When you're out shopping for homecoming dresses this fall, embrace your own sense of style and perk up your look with dazzling accents instead of trying to reinvent yourself. 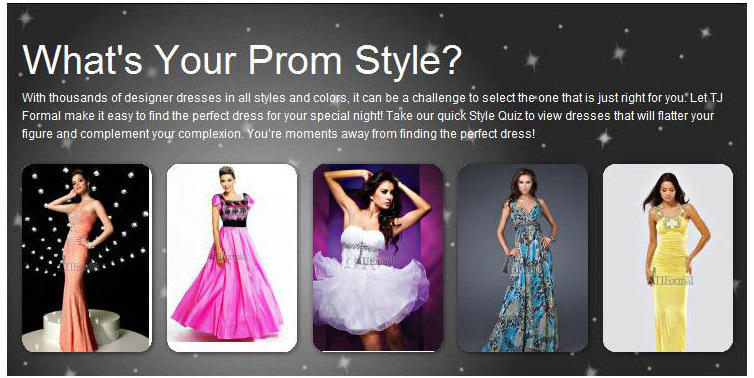 Take the dress quiz to find out your personal style! SO COOL! Thanks - this is so much fun. I just love looking at the newest styles - better than having a magazine - I can zoom in and really look at them.